How do I view course content offline as an HTML file as a student? If your institution has enabled offline content, you can view your course offline as an HTML file. You can download the HTML file from the Modules page and view any content available in each module. Currently HTML files can only be generated in the browser version of Canvas and are only supported on a computer. HTML offline content is for offline viewing only; you cannot interact with course content directly, such as completing an assignment or viewing any submissions. In the HTML file, you can view assignment details, availability dates, and point values. Discussions and quizzes only include the description. All discussion replies (graded or ungraded) are considered submissions and must be viewed online. Additionally, you can view any embedded media files in the HTML file. If a link can only be accessed online, the link includes an external icon identifying the content as online only. Content items within modules are available if you have permission to view them. However, content items locked by modules or by date are not included in offline content and show that the content is not available. Offline downloads include all content from the course at the time of the download. You will need to download the course each time you want to view updated course content. After the initial download, the export page shows the history of each download, and the Modules page shows the last time the content was exported. When exporting course content, you may not reproduce or communicate any of the content in the course, including exported files, without your institution's prior written permission. Please be aware of your institution's online user agreement guidelines. If your Course Home Page is set to Modules, you can export course content from the Course Home Page. Offline content cannot be downloaded once a course is concluded. If your course does not allow access to the Modules page, or if your course Modules page does not display the Export Course Content button, offline content is not available in your course. However, your institution may allow you to export course content as an ePub file. Click the Export Course Content button. The course will download to your computer as a ZIP file. If you remain in the page until the download is complete, the file will download directly to your computer. If you leave the page, you'll receive an email notification when the course download is complete. You can use a link in the email to download the file. When the export is complete, the Exported Package History page shows the most recent export. To download the export again, click the date of the export. If you export the course again at a later date, the most recent export will always display in the page, along with previous exports. Once the file has been downloaded, locate the ZIP file on your computer . Double click the file to open it (MAC users) or right-click the file and select Extract All (PC users). 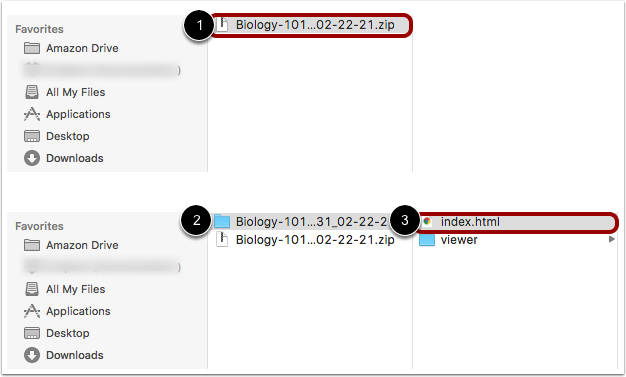 When the file expands, open the course folder  and open the index.html file . The HTML file will open in your default browser. Offline downloads include all content from the course at the time of the download . You will need to download the course each time you want to view updated course content. If any content can only be accessed online, the content link includes an external icon identifying the content as online only . To view course files, click the Files link . To open course content, click the name of the content . View the content in the course file. To view the next content item in the module, click the Next button . 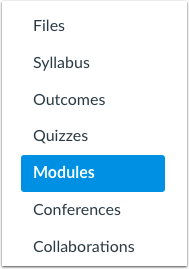 To return to the main Modules page, click the name of the course in the page footer . Previous Topic:How do I choose an assignment path in a module? Next Topic:How do I view Pages as a student? Table of Contents > Modules > How do I view course content offline as an HTML file as a student? This is such a great tool! I'm wondering if there's any direction on how to use these files on Mobile/Tablet devices? I've been trying to use the files on my Android and they will not load. Our sincere apologies for the delay in our response time. We've been dealing with a bug in our notification system, which means that some of our new comments have gone unaddressed. We're so sorry about that! We're wondering if you found a solution to your question yet. The best way to view these files on a mobile and/or tablet device is by downloading them and opening them in an app that supports HTML file types. For instance, you could download the file to a drive such as Google or Dropbox, open that drive on the mobile/tablet device, and then find and open the file there or select a third-party app to view the file. Hopefully this helps to answer your question. If you have any further questions, please don't hesitate to reach out. No worries, Allie. Thanks for replying. I'll try it using google drive or dropbox instead of downloading and saving to my phone directly. I have an android phone and trying to extract the files and view them via the android browser and chrome didn't work. Re: How can a student download course content?